Over the next 4 weeks we’re going to cover the essentials of creating the perfect bedroom for the gentleman of today. A bedroom shouldn’t be a page out of an Ikea catalogue; it should be a space that’s unique and representative of you. It’s your sanctuary, a place where you are comfortable and at ease. It’s important to first focus on what to hide. No, not your condoms. I’m talking about how everything is organized. No matter how much time you spend on decorating, no one is going to notice if it’s covered in clutter and clothes. Before you can create the space, you must make the space for it. Not only is it aesthetically pleasing, but it also serves a functional purpose for preserving your possessions. Closet space is always at a premium, but some things are meant to be hidden. This is certainly the case when it comes to the hamper. No one wants to see or smell dirty clothes, even if you spend $400 dollars on Xerxes’ hamper. By moving your hamper to your closet, you not only get rid of this unsightly object, but it also opens up space for you to display more interesting things than soiled laundry. In addition to a hamper, it’s important to make space for all of your shoes in your closet. Leaving shoes out in the open clutters the floor, putting you in harms way when you stumble into your dark room after happy hour. One of the easiest ways to take care of this problem is by investing in a shoe rack. They don’t take up a ton of space in your closet and they can easily fit several pairs. As Frank mentioned in the Protecting Your Investments - Garments article, proper hangers are vital to the protection of your most valuable garments. Wood looks best, but the important thing is to have hangers which mimics the shape of the shoulder. This preserves the fit of the garment. On a related note, unless you’re trying to pick a lock, transfer anything that comes on a metal hanger as they might be harmful for garments in the long run. 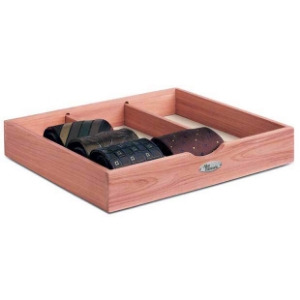 When organizing men’s garments, ties and belts often don’t get attention. As a result, they are usually thrown over a hanger or a closet rack. This is fine at first but trust me, they’ll eventually be strewn on the floor of your closet, which is a terrible way to store them. If you’re strapped for space, incorporate a tie & belt rack into your closet. With a few screws and some drilling (be mature now), you can add something like this, which organizes both into an efficient setup that uses minimal space. For those who can’t or won’t drill into their wall, grab a tie box and roll your ties. In fact, it’s better to store linen ties this way. By the end of the day we’re going to end up with a lot of “stuff” in our pockets. Whether its receipts, loose change, or other garbage, it usually ends up on your night table. You don’t want people to see the receipt from Taco Bell that shows you purchased 11 chalupas. So get a small plastic bin and designate it as the “stuff” box. Be sure to clean it out each week as you’re going to run out of space. Anything that you need to hold onto can be moved to more permanent storage bins. Not every decision you made in college was bad, and one college habit you should get back into is using the space underneath the bed. Like closet space, dresser space always seems to be at a premium. If your sweaters are wasting space in the summer, put them in storage until it’s sweater season again. Grab a few of these Made in the USA containers from the Container Store for storing your seasonal items and slide them under your bed during the offseason. During the winter, these containers become an obvious location for your summer apparel. Even though organizing the bedroom is the most monotonous step in creating your bedroom, it’s probably the most important. With proper organization, you’ll have a clear canvas to create a bedroom that makes a statement about you. To channel MTV cribs, the next article in “The Gentleman’s Bedroom” series will focus on where the magic happens: the bed.